25 Small Ways to Pay It Forward - Kindness Matters! 25 Small Ways to Pay It Forward – Kindness Matters! I read an article on the Today Show website talking about Luke Perry and his random acts of kindness. For those in my generation, losing him hit us hard. Reading about what a good guy he was makes us feel the loss even more. I wanted to reshare this post to encourage all of us to do we can to lift each other up. You can share your kind acts at kindness1billion.org and be inspired by others. Together we can restore our faith in each other, and model a higher calling for our children. Have you ever been on the receiving end of a kind gesture from a stranger? It brings a smile to your face and a warm feeling, doesn’t it? I have put together a list of 25 small acts of kindness to inspire us and to share with others because #KindnessMatters! I would love to include your ideas in a future update. 1. Write a note or an email to someone’s supervisor when you have something positive to say. Take a minute and fill out a survey praising a store employee who is doing a good job. You can also post it on the company Facebook page or send a tweet. This could be more valuable than a tip to that employee! 2. Along with your tip, write a thank you note to your server on the restaurant check. 4. Write out a sympathy card not only with condolences but with a few personal memories of how the deceased person impacted your life. We lost my Dad several years ago and my Mom still reads the cards and letters she got after he passed away. Even if some time has gone by, it is never too late to share a memory of a loved one with someone who is grieving. 5. Be a coupon fairy! Leave a coupon for someone else to find or give a fellow shopper your leftover store coupons. I like to leave diaper coupons on the shelf in the grocery store. Do you know how expensive diapers are these days? 6. Buy extra toiletries when you spot a great deal or a freebie along with items like granola bars and give them out when you see someone in need. Ask your dentist for free toothbrushes and toothpaste and save your hotel toiletry products. I use gallon-size baggies to store my care packs and keep them in my car. 7. Keep extra umbrellas in your car and give them away when you see someone caught in an unexpected rainstorm. If you have extra hats, gloves, scarves, blankets and coats, you can also give these away to someone in need or to someone who did not prepare for the weather. You can also help someone to stay warm this winter by donating winter gear to One Warm Coat . Visit their website to find a local drop off location. 8. Buy something for the person in the line behind you. If you have a small balance left on a gift card after your purchase, ask the cashier to apply it toward the next person’s bill. 9. Bring a treat to a neighbor or your co-workers. Double the batch of what you are cooking or baking and look for someone to share it with. 10. Learn CPR at www.redcross.org/take-a-class and you may end up saving a life! Find a local blood drive or go to your local blood bank and donate blood. The American Red Cross can help you to find a blood drive near you or help you to organize a blood drive. 11. Become an organ donor and give the gift of life. Go to organdonor.gov to find out more information. Did you know that 1 organ donor can save up to 8 lives? 12. Donate your time or money to a local charity. To match your interests and skills, find volunteer options at sites like Volunteermatch.org or the United Way. 13. Organize a charity drive at your job. You can collect sport equipment, old eyeglasses, toys, canned food, musical instruments, old cell phones, office supplies, unneeded electronics and find a charity or program who would love to have your items. Use the DonationTown website to find your charity of choice, charities that pick up items for free, acceptable items wanted by individual charities and schedule a pick up right from their website. The charities will also provide an IRS tax-deduction receipt for your donations. 14. Meet a need in a classroom through DonorsChoose.org. Public school teachers post classroom supply requests and you can give any amount to the project that inspires you. 15. Donate some or all of your frequent flier miles to a favorite charity such as the Make-A-Wish® Foundation. 16. Drop off your old eyeglasses at LensCrafters for project OneSight. They provide comprehensive eye exams, vision care and customized prescription glasses to people in need throughout the world. 17. Send a care package to a service member. A site called AnySoldier.com can show you what to send, who to send it to, and how to send it. 18. Make a trip to the pump a little less painful for your fellow driver and leave a few dollars paid for at the gas pump for the next driver. 19. Invite someone to your home for a holiday meal. You can seek out a student from another county, a family new to your area, or a widow or recently divorced friend. Don’t assume everyone has a big happy family to be with during the holidays. 20. Share a meal with someone in need by donating to your local food bank. Feeding America can help you find one in your area. 21. Share the bounty of your garden or fruit tree with neighbors or those in need. The website AmpleHarvest works to eliminate hunger and malnutrition and feeds over 40 million Americans from excess food in gardens, and local food pantries. 22. Donate pet food, pet food coupons, leashes, ad pet supplies to your local pet shelter or rescue organization. 23. Bring out and take in trash cans for a neighbor. 24. Offer to be a point of contact for an elderly neighbor. Offer your phone number to their children and be available to look in on your neighbor. My elderly Mom lives across the county and my sisters and I start to panic when we cannot reach her by telephone. It would be so reassuring to have a neighbor that we could call, just to check on her. 25. Start a family tradition of giving. Put together a piggy bank and have regular family meetings to discuss how to save more money toward your cause and take turns finding a recipient. Don’t let the mean people win! 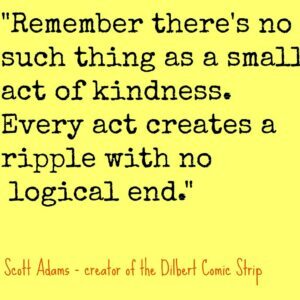 Start a kindness ripple today and come back and share your #KindnessMatters story.